From fallen trees during the hurricane “Gudrun” in 2005, 300 logs were made and a log house and a log house sauna were built. The log house is built with the typical log house technique and between the logs, flax is used to keep the house warm at winter time. In 2008 the log house stood ready for the first guests. 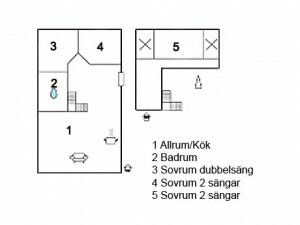 The house is located in scenic scenery with access to nature baths and the wooden fired sauna. If you like fishing there is a close-by lake where you can catch your own fish using the little rowing-boat. The log house is surrounded by many forest paths and trails. There are many opportunities for recreation, “The green serenity”. Equipment: Kitchen with stove, dishwasher, fridge freezer, microwave and coffee maker Washer and dryer TV with satellite, radio Bathroom with underfloor heating, hot water, toilet and shower.